Yesterday, Worksafe released a brand new report titled Analysis of Tesla Injury Rates: 2014 to 2017. The report scrutinizes Tesla's health and safety record, questions the company's recent claims, and calls for greater worker involvement. Over the past several months, workers at Tesla have become increasingly aware of the potential safety hazards at the company’s flagship vehicle plant in Fremont, California. We analyzed these logs in order to interpret the data and evaluate how their plant compared to other auto manufacturing facilities. What we found was troubling: Tesla’s total recordable incidence rate (TRIR) in 2015 was 31 percent higher than the industry-wide incident rate. 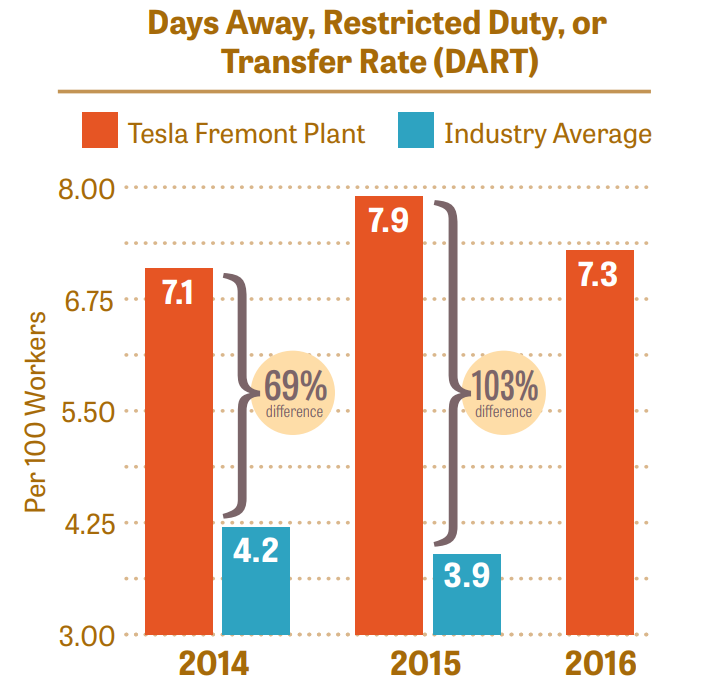 And the rate of serious injuries at Tesla’s Fremont plant (those that result in days away from work, restricted duty, or job transfer) has been approximately double the industry rate. Within hours, our report garnered widespread media attention across state, national, and even international outlets. Check out a few examples in the LA Times, CBS News, the Gaurdian, Forbes, and the Daily Mail. The buzz surrounding this story demonstrates that our efforts are important, impactful, and timely. We're brimming with gratitude for our supporters and allies. You make our work possible, inspire our successes, and keep us focused on the ultimate vision: health, safety, and justice for all workers.